THE ELECTIONS TAKES PLACE FROM 27 JANUARY 2014 TO 06 FEBRUARY 2014. THEME: RALLY DESTITUTE STUDENT MASSES BEHIND REVOLUTIONARY SOCIALIST IDEAS TOWARDS FREE AND SOCIALIST EDUCATION!!! The Pan Africanist Students Movement of Azania (PASMA), as a custodian and vanguard of the genuine aspirations of students is committed to jealously defend students against the attack of capitalism in the education system, eradicating all these ruthless characters that find host in this system and complement capitalism, these being: neo-colonialism, commoditization of education, racism and all forms of discrimination, and oppression such as financial and academic exclusions. With no fear of over simplification, contradiction or rhetoric it is meet that we reinforce that: Having an SRC is not a privilege for students nor is it a favour from the various management bodies in our Universities to us as students being the major stakeholders as beneficiaries and recipients of higher education, but rather legislated, statutory entity that is provisioned for in the Higher Education Act 101 of 1997. Every SRC is the supreme body through which students advance their views and fight for what is rightfully their social and academic interest, a right to education! Our tireless commitment to the cause of attaining a free, obligatory and quality socialist education in South Africa remains laconic and unwavering demand, hence we shall continue to be very radical and unapologetic in dealing with any man-made obstacle that manifests itself against the will of the masses. We lament the lip service that has been done by universities on the question of access, insofar as registration is concerned and this does not mean the entire Ministry of education is immune from this despicable act of brutality against the African child. Institutional Autonomy and academic freedom is one of the fundamental reasons why an African child is forced to endure unjust and evil acts of exclusions and poor quality learning environment in the lecture halls, residences, sport fields, services, in which the entire student populace is subjected daily. The Pan Africanist Students Movement of Azania (PASMA) regards education as central to the personal development of members of society, as a critical ingredient in the development of our society and as indispensable to the development of our productive forces and capacity, and transformation of relations of tolerance of greed and cross conspicuous consumption that has no social and moral value in the development of the African student, and society at large. We highly condemn exorbitant fees of the University and the perpetual annual increment. We view this as financial exclusion of students particularly from the working class background and makes education only accessible to children of the capitalists. We call for FREE EDUCATION FOR ALL irrespective of gender, race and social position; at public cost. We further object to other forms of exclusion (academic, social, etc) as contrary to the imperative of social development. We demand a democratic education system free from evil and immoral policies aimed at poor students from the impoverished working class families. # Library services: We call for 24- hour library services and study centre at all campuses of the institution. # Free internet services: The scientific development of mankind over the last few centuries has made almost impossible to make any academic advancement without the internet. It is along this line that we demand massive and FREE internet service, provision for Wi-Fi in all campus and accessible anywhere in the campus including inside our residences. # Free Bus Services: We demand free inter and intra campus bus services for all inclusive of non-residence students. # Quality catering and a balanced diet/nutrition: We demand healthy, quality and affordable catering services at all cafeterias and dining halls. # Provision for Student Residences: We call for the building of more residences to accommodate all students with the desire to use them and we demand regular supervision and improved services of the state of the existing residences to ensure that they are maintain good living conditions. # Academic Support Services: We call for the establishment of student Academic Support Services in all campuses with qualified tutors, academic counselors per faculty and psychologist to assist students in their academic and social related problems. # Increment of Books and Meals allowance: We demand an increment to books and meals students to cover all students prescribed books needs and their healthy and preferred meals for all students that are beneficiaries of financial aid. # Student support services are the most important assets for any student to achieve his/her academic ambitions; we will therefore not compromise in as far as this item is concerned. # We would like to brutally condemn corruption and maladministration of our institutions. Corruption and maladministration plunged our campuses into crisis after the other, ranging from financial maladministration, forgery of qualifications, tender related corruption and hiring of unqualified lecturers and staff. # We demand de-privatization of all university services including student bashes to avoid tender related corruption. # We demand provision for students and general workers to sit in all governing committees and panels including structures responsible of appointing and hiring lecturers, managers and staff at the university to deepen democracy, transparency and accountability. # We further demand an establishment of worker-student-community watchdog committee to audit all finances of the university and they should be regularly furnished with audited statements of all operations in the university. # Racism (White Supremacy) and Sexism: We view these two as nothing but particular manifestations of capitalism just like Colonialism and Apartheid, therefore our struggle against them can never be separated from our broader struggle against capitalism, neo-colonialism and imperialism for a socialist revolution that shall present a major breakthrough towards a classless society without both racism and sexism. # Xenophobia (or Afrophobia): We condemn as neo-colonialist exclusion of students from other parts of Africa from financial aid scheme and subjecting them to payment of high fees and reactionary foreign levy. We further condemn all the unnecessary bureaucratic process of application for study permit and passports that African students are always subjected to each time they choose to come study in this country. We demand equal treatment for all students irrespective of your origin. # Homophobia: We reject as conservative the abuse and the discrimination of students on the basis of their sexual orientation. We call for equal treatment of gays, lesbians, bi-sexual, transgender, etc. and we shall protect them against all forms of abuse. # Religious discrimination: We have noticed with greatness the discrimination of other religious denominations by our reactionary managements and we demand equal space for students from different religious denominations to worship and do the rituals. # Discrimination of differently “able’d” (others wrongly referred to as disabled) people: We demand proper facility to accommodate needs and aspirations of disabled students in all campuses and further demand a disability bursaries for all disabled irrespective of social position and/or family background. The current education system and curricula, as inherited directly from Settler Colonial Apartheid State without any change. The purpose of the Settler Colonial Apartheid system has been designed as part of the capitalist machinery which aimed to brain damage the African Child’s mind by retaining the state of servitude of the African people thus produce a capitalist labour force. We demand and advocate for an education systems that shall be underpinned by goals such as economic development and emancipation of the African and humanity from all forms social constructs which aims to retain a (contemporary) modern slave system. We also reject as mere lip service the pseudo transformation agenda as advanced by the current neo-colonial regime because we believe that transformation of education can never be isolated from the transformation of the other sectors and the transformation of the society at large. Our transformation agenda is linked with our demand for free and socialist education and linked in fate with the poor working class struggles against exploitation and oppression as perpetuated through neo-liberalism, capitalism and imperialism. We agitate for education system and curricula that is free from capitalist propaganda and exclusion but directly intertwined in terms of content and fate with workers struggle for emancipation and advancement of socialist struggle. Discrimination of African languages: WE demand that the universities should introduce two or three African Languages and at all students should be required to register and study at least two African languages. We all witnessed brutal victimizations of students and their leaders each time they exercise their democratic rights; a right to protest and picket in advancement of students’ interests. We condemn as barbaric settler colonial apartheid era methods such as the shooting of students, usage of internal, external (bouncers) and state security forces to suppress protests and of course arrests and expulsions of innocent students and student revolutionaries. We demand withdrawal of all cases against all victimized students and leaders and call for reinstatement of expelled students and leaders. We have noted that these evil acts as perpetuated by our evil university managements are highly condoned by the Ministry of Higher Education as led by a pseudo communist. It is crystal clear that the task of this nature can only be bestowed upon the almighty student vanguard, the Pan Africanist Student Movement of Azania (PASMA). This of course is due to our strong conviction to combat all these evils mentioned above and PASMA being tried and tested in many universities across the country before and it is needless to state that we succeeded unscathed. As a student movement, we pledge to remain committed to the cause of liberating the African masses within our domain that currently remain oppressed and traumatized as a result of the current commodified education system in this country, and as we ask you to vote for PASMA, we borrow your attention to focus on this overview of our challenges as students and solutions that come thereafter. DON’T THINK TWICE! 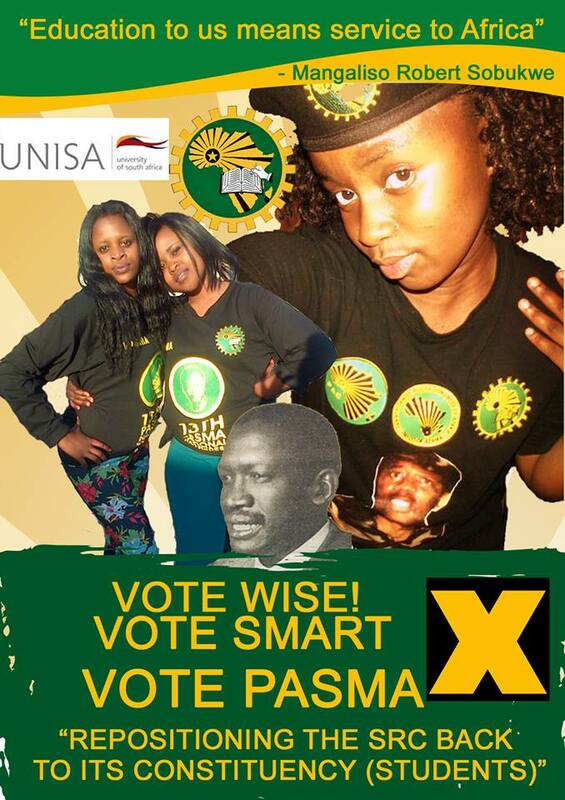 VOTE PASMA! TO VOTE VISIT A VOTING STATION AT YOUR NEAREST UNISA SITE OR VOTE ONLINE USING SPECIAL UNIQUE PIN SENT TO ALL REGISTERED STUDENTS! FOR MORE INFORMATION CONTACT: MOLESENG EVANS MALEPE ON 0729220392 OR THABO MATLANYANA 0747215654.